On Tuesday , the City of Cambridge is hosting the first in a series of public meetings about major upgrades coming to River St. With the road design itself slated for changes, now is an ideal time for Cambridge to turn River St.’s narrow, cracked painted bike lane into a smooth, safe new protected bike lane. Tuesday, March 26 // 6:00 – 8:30 p.m.
As the first public meeting for this project, Tuesday is primarily an opportunity for residents to tell the City what you like and don’t like about River St. We urge you to attend so the city hears from the many people who regularly bike along this route between Cambridge and Lower Allston, and within Cambridgeport, and who are frustrated with the current poor state of infrastructure. Having a safe, separated bike lane on River St. would also help avoid contraflow riding on the adjacent Western Ave cycletrack. The city’s initial bike plan shows a protected bike lane on River St., though in the past that hasn’t mean implementation. Your voices will ensure this critical feature is included in the final design. Planning is scheduled to run throughout 2019, with construction set to begin early next year. Suggested road improvements outlined in Cambridge’s draft plan. Show up and speak up! 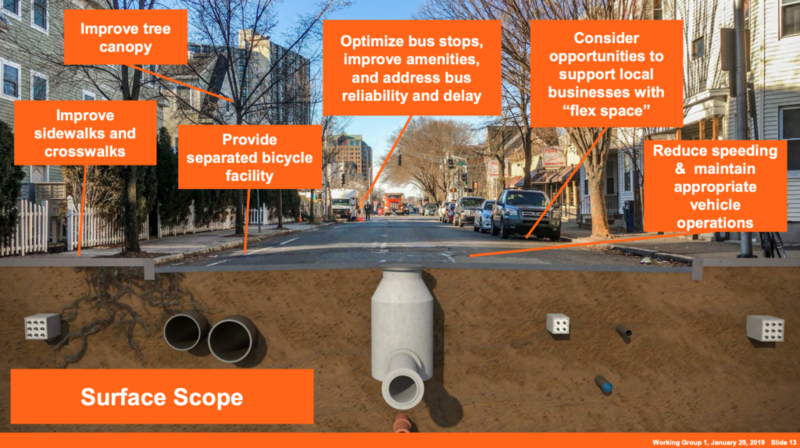 — Attend Tuesday’s hearing and tell Cambridge to install protected bike lanes on River St. alongside other road improvements. Submit feedback — If you can’t attend Tuesday, you can submit feedback via this form, or by contacting Justin Schreiber, (riverstreet@cambridgema.gov, 617-349-6012); CC info@bostoncyclistsunion.org when emailing so we can track our impact. Pinpoint your concerns — Using this Wikimap, you can note specific areas of concern along River St. Hate riding through a specific intersection? Put it on the map! Endorse the Cambridge Cycling Safety Ordinance — If you have yet to do so, there’s still time to throw your weight behind this ordinance that would result in many new miles of protected bike lanes in the near future. You can read more about the ordinance here, and then email council@cambridgema.gov, cc’ing ldepasquale@cambridgema.gov, clerk@cambridgema.gov, and info@bostoncyclistsunion.org to show your support. Cambridge has made steady progress in recent years in building out a protected, connected bike network. Let’s ensure they keep that momentum going! On Wednesday, Somerville will host the first in a series of community meetings intended to shape and accelerate the city’s Vision Zero strategy. We encourage all of you — especially Somerville residents — to attend to ensure your voices are heard and the safety of cyclists is adequately represented! These are Somerville’s first public-facing hearings about Vision Zero, making this an excellent opportunity to shape important projects and policies for years to come. Wednesday, April 24 // 6 p.m.
Somerville, like Cambridge, has made encouraging progress on bike safety in recent years. It boasts a rare gold-level rating from the League of American Bicyclists, and ranks among the top five cities nationwide for share of commuters who bike. We know Somerville shares our priorities around bikes, and this is your chance to help the city translate those beliefs into action.